In its ongoing efforts to reinvent the brand after three years of declining guest counts and closing stores, Fazoli’s opened its second new prototype store last week in Dayton, Ohio. The Dayton prototype follows the opening of a similar prototype in the St. Louis suburb of Edwardsville, Illinois. The new prototypes are the latest updates for the brand, which also refashioned a number of stores in the Dayton market, and changed about 80 percent of its menu last year. 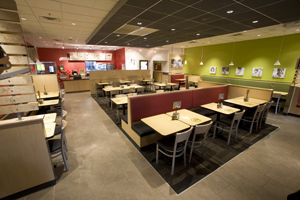 With much fanfare— a red carpet greeted local celebrities, VIP community members, and the several Fazoli’s executives that participated in the event—the Dayton prototype opened its doors, an inline unit boasting a smaller footprint than the typical standalone Fazoli’s, along with more vibrant colors, china plateware, and partial table service. Before the festivities, Fazoli’s CEO and president Carl Howard sat down with QSR to discuss why the brand developed its newest prototype, and how the new look fits in with the future of the brand. Why was there a need to do a new prototype? It’s been 20 years since our original design. The current look was a little bit dated. We wanted to go out and get a new, fresh, modern design. We hired a company out of Columbus, Ohio, called WD Partners, who did a fantastic job designing and putting together our new prototype. What does the new prototype say about the future of Fazoli’s? It signals the fact that we’re on the cusp of a brand new growth period for the business. This is our second restaurant that we’ve opened this year. It’s the first new company restaurant that we’ve opened in over five years. We have two franchise locations that are currently under construction, and those will be the first two franchise locations that have opened up in over four years. So it’s really a good period for us. The brand is starting to grow again, and we’re really excited about our future. Is this a reinvention of Fazoli’s? Yeah. We’ve revitalized the whole brand. The prototype is just a small part of what we’ve done. We’ve completely changed the menu—we’ve changed 80 percent of our menu since this time last year. We’ve added a new, enhanced service. We’ve changed the facility, the environment, the service, and the food, and we’ve left our prices intact. We think that’s a really good strategy for us. Is every new Fazoli’s going to be the new prototype? Every new restaurant we do will have this look, design, and feel. They may not all … be perfect copies, because we’ll be doing some conversions. They might not all be inline or in a strip center, they could still be free standing. There are a lot of restaurants that exist right now where franchisees are looking to put a new concept in. So we have a design where you could go into a Hardee’s or a location like that and completely retrofit it into a new Fazoli’s. What is the cost of the new prototype compared with the cost of the old? We’re at about a third of the cost. We’re spending roughly $500,000 to get the new inline prototype open. [The old model] was close to $1.5 million, $1.7 million by the time you get the building and the land and you get the facility build, so it’s quite a bit less expensive. How are customers reacting to the new prototype in St. Louis? Very favorably. We’re averaging about 40 percent higher than where we thought we were going to be. So that really exceeds our expectations. We have a site selection company, Birchwood, who helps us gauge what our top-line sales are going to be. Since these new locations do not have drive thrus, we really kind of lowered our sales forecast. Edwardsville is the only Fazoli’s that doesn’t have a drive thru, until [the new Dayton store]. Drive thru being 40 percent of our business, it was a pretty aggressive strategy to go without one. We took the Birchwood sales projections and brought it down by 20 percent, and thought we would be able to do solid carryout business and curbside. We’re doing almost 25 percent in carryout and curbside. Are you trying to earn new consumers, or impress the old? Both. First, the most important thing for us was not to lose any traction with our current loyal guests. The changes that we made, we felt pretty positive that it would not affect the current guests. We upgraded the food quality. We’re giving them servers so they don’t have to get up and get food or get an extra breadstick. We made the building nicer on the inside. So we changed the food, we changed the service, and we changed the environment, and in [the Dayton] market we actually lowered the check a little bit. We touched the three most important things about the business, and we lowered the price. It wasn’t a dramatic price decrease—for example, our salads went from $5.49 to $4.99. We added a food runner to run your food; our current restaurants have pagers, and you have to go up and get the food. We do believe we can also attract new guests. So, it’s been great for our current guests, but we think that we’ll be able to attract new guests, or maybe lapsed users. And the reason why is we’ve really upgraded our food quality, we’ve kept prices the same, and we’ve added service in this environment where people are being hyper-sensitive to the dollars they spend away from home on food. It gives us a fantastic competitive edge in this environment. Franchisees reacting well to the new changes? They’re cautiously optimistic. The brand’s been through 20 years of good and bad times, so now they’re waiting to see how it works. I was speaking with our franchise chairman the other day, and I was sharing with him our results in Dayton, and his comment was, “We’ve got to figure out a way to get this financed for everybody.” And that’s a good sign. Will there be additional costs for franchisees? We have a remodel package available with the new plateware and the new look that will cost … $50,000 for the whole thing. Very affordable. We’ll be all in about $500,000 here, and we think that’ll be a pretty consistent cost, maybe even lower, because we’re learning things here that we wouldn’t do next time. A free-standing prototype, to buy the land, build the building, it’s a million and a half or more. Where do you see Fazoli’s in five years? Our internal thoughts are we’ll be back over 400 locations. It’ll still be a pretty close split of company and franchise. We’re going to do five company restaurants and two franchisees this year, and our growth plan would be to double that next year—10 company restaurants, and four franchised. But we would not limit the number of franchise businesses we could do, because we have the team and the infrastructure to do more.